Hey, I just brought my Apple TV 2 back from the living dead. After a botched firmware update all it did was flashing the white LED fast (about 3 times a second). I followed the official reset instructions using the Apple remote but that didn’t help at all. Then I came across a few posts that said that by hooking up Apple TV 2 to a Mac using just a micro USB cable, you could actually restore it in iTunes. Those posts explicitly said that you have to disconnect HDMI and power and just plug in the USB cable. I dug out a micro USB cable and connected it to my Mac. 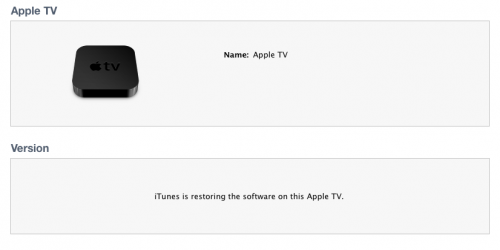 Shortly after, iTunes showed up with the restore screen for Apple TV 2. So far, so good. But every time during the early stages of the update process, one of those error messages appeared. It just didn’t work. I was already thinking about returning it back to Apple, when I had an idea. Maybe the power delivered by the Mac’s USB port isn’t enough for whatever goes on during the restore process? So I connected a power cable after (!) Apple TV 2 showed up as being restorable in iTunes and voilà, the restore went through without a hitch! If your Apple TV 2 is stuck with a fast flashing LED and iTunes fails to restore it using a micro USB cable, just connect the power cable as well and the restore might get through. Apple TV 2 should now start flashing the LED wildly and appear in iTunes with the restore button. If it still doesn’t show up, maybe there’s something wrong with your cable. I was using a wiggly micro USB plug that needed some weight put on it in order to have a reliable connection. If you always receive the 1602 error at the end of the restore process, it could help to restore Apple TV 2 using Xcode’s Organizer instead of iTunes. Next PostTRIM support on its way for Mac OS X Lion 10.7? Oh God, I remember when I first got the 1602 error. I connected the USB and the power cable, received the 1602 error, but with fixed light! I connected then to my TV and works perfectly! great job! Thank you! I have the same issue with the blinking light, but when plugged into my television, I see the Apple logo, then the device shuts down, then it restarts to apple logo, then shuts down again. I’ve tried plugging it into my computer but it doesn’t appear in iTunes. My iTunes is up to date, and I’ve plugged the Apple TV into power after connecting the USB. Any ideas? I had to remove all of the Apple software (iTunes, QT, Bonjour…) on my Dell running Windows XP and then restarted. Then I reinstalled iTunes and quicktime from the Apple website. I could then use the micro usb cable with the Apple TV 2 and the restoreworked fine without the need of the power cable. Buy a new one. Box up old atv2 in the new box. Return for full refund. Don’t let crappy software cost you. Let them take the lose. No warranty worries. Same here error 9 keeps coming up have tried two USB cords and two computers warranty expired, need help! ! This worked for me. Many thanks. Now to try another attempt at JB’ing the thing. Restored my Apple TV 2 using this fix. Like Terry above, I too got the 1602 error at the end but that didn’t affect it. Many thanks. ive updated apple tv2 to 4.4.4 by using this thread (thx) and fund that I’m missing the netflix menu under internet. this I’ve tried to google – but no answers. anyone here that tried this ? i have an netflix account at it worked fine before updating to 4.4.4. Just wanted to give a shout out for this post as well… plugging in the power cable after the micro USB cable made the errors go away! I was able to restore my ATV2 without any issues. I did get the 1602 error at the end but that didn’t seem to matter. Thanks! wanted to stop by and say thank you. after jailbreaking my ATV2, and then trying to update in October, the thing totally crashed and there was nothing but the Apple onscreen, I thought I had totally messed it up beyond repaid. However I persevered and read forum after forum. This one was the best (THANK YOU) as it described the combination of everything I needed: Plugging in the power is essential, as is the Menu/Play combination for 15 seconds. But the absolute KEY was jiggling / holding the mini USB in place. It took be about 5 goes, with loads of failed tries and error messages (mostly 1602 or 9) …. and in fact it never actually completed the firmware installation that followed the software installation …. and note I had to hold the mini usb absolutely stock still for about 5 mins while the update happened. Eventually I noticed the white light was steady …. so I plugged it into the TV via HDMI and hey presto, I got the regular setup menu, and was able to get as far as the settings where I went straight to system reset where it reset the whole thing ….. and back to normal. FYI – After repeated 1602 errors, I plugged the Apple TV back into the HDMI cable, it worked fine after going through the set-up menus. So I had the same issue as everyone else. After being prompted a bunch of times to make the firmware update I relented and it failed and the micro USB graphic with the iTunes icon would display on my television. I went and got a micro USB cable and tried restoring numerous times both following these recommendations (above) and not. It still failed and resulted in a 1602 error every time so I took the unit back the Apple store near me. Wasn’t able to get a Genius appointment at the time and they wouldn’t flat out exchange the unit so on a hunch when I got home I hooked it back up to the tv. It had been restored and was on the initial set up screen despite the fact that iTunes was saying the restore failed and was throwing the 1602 error. So check to make sure the unit isn’t restored even if you get the 1602 error. Thanks, the USB without the power lead and hitting the DFU set up sorted me not being able to get the TV recognised in iTunes. Now updated thanks. thank you, your article helps me ! Thank you for the post. I was experiencing the blinking light of death and could not get the Apple TV to show up in iTunes until I plugged in the power cord. Thanks again! I spoke to apple. The rep on the phone admitted that he had received 3 such calls that day and there was definitely a problem with the software update. He said that since I had fixed my apple Tv myself not much to do…..but had I called with a failed restore through itunes apple would replace the appletv at no charge within the 1 year period(even if I did not have a support plan with them). All that I would have to do was to walk into an apple store with the defective apple tv and they would replace it. Just sharing this on this board if some one else is also suffering the same issue. I kept getting 1602 after restoring firmware, power cable did not make a difference. I was about to give up when I tried another micro usb cable, and the restore worked without a hitch, not sure why and it does not make sense. I did do a reboot in between so perhaps that’s why. Great tip, the most recent update failed, but performing the restore provided both the update and a functional Apple TV. Worked for me the first time. Didn’t even have to use the power cord. Thank for the info! Got 4.4(3140) working on my appletv2……but apple really messed up with this update. Now when I scroll through the menus ….a voice reads of all the menu items… This obviously was beta which was rushed out by apple withour proper QA. Anyways the voice is a minor irritant….but the apple tv box works….so wont touch it for some time. See above. I ignored the 1602, re-connected it to the tv and it works fine. Did an Apple TV update and the box bricked it self. Kept getting 1602 error. Updated to latest itunes. Worked just like dee1722’s did. Why do you say to not update the software? Anyone reading this message, DO NOT UPDATE YOUR APPLE TV SOFTWARE! I wish I had known!!! I literally RAN to the Apple store, bought an AppleTV a minute before they closed. Got it home, agreed when it said it wanted to update the software…and then it bricked itself. Looks like there must be a rogue update that’s bricking them right now. Using the micro USB cable worked for me after the update failed on Oct. 14, 2011. The cable I used is the same one I use to charge my phone if that helps anyone. I also run a program called ASUS Ai Charger on my pc that ups the power output on my USB ports so they’ll charge my iPad2. Why Apple have to do an up date that requir to conect to iTunes? Why did like that? I tried 3 times up to if didnt work I have to take it to Apple store! Update should not requir iatune like before. i wish some can rase this point not all have Itune and not all have amc book?! The trickiest part of this for me was finding the micro (NOT mini) USB cable. None of the camera cables I had worked, but tracked one down at RadioShack. Attached to my fully-updated Mac, and the update went through seamlessly. No power required! Cheers. Awesome, thanks. No power/USB restored and worked. After having problems trying to update to Apple TV 2 version 4.4 (just after release of iTunes 5), I tried to restore but kept getting restore error message 1602. I tried the methods listed above several times including different micro USB cables and the power cables. Then I realized that I might need to update iTunes to the latest version and then try restore. Worked perfectly without power supply!!! Rocketfish from Best Buy. about $20.00. The re-boot worked with the micro USB and apple tv power source through my macbook even though I received “error 1602” after the finish. The light had quit blinking rapidly after this “failed reboot”, so, on the chance that it might be repaired, I connected the apple to the HD tv again, and it works so far. Many thanks! It worked for me too. Connected it on my pc to itunes with the apple tv on a usb. Thank you. Only this solution solved my problem. Now it works again. Thank you so much! We were so frustrated until we found your post! THanks a lot dude, you’re a star * it’s worked just perfect. Thanks for the info. I went to power off the ATV by removing the power plug and saw that the PC was able to keep the Apple TV alive through the USB port. As soon as I removed the power cable, Itunes recognized the ATV and I could restore. Yippee! Thanks!!! I’ve tried for days and this is the only thing that worked!!! THIS WORKED!! THE POWER CABLE!